Hawaiʻi Island Police are continuing their investigation into an assault which occurred in Kailua-Kona on Wednesday, (March 20), where an adult woman sustained a single gun-shot wound. Investigators, acting on a combination of leads and community tips, focused their efforts in the North Kohala District mid-day, Thursday, (March 21). 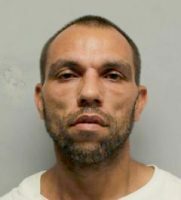 The suspect was seen in his vehicle and refused to surrender to police, which lead to a police pursuit and the closure of roads and evacuation of residents in Hawi. Several officers fired rounds into the suspect’s vehicle at two locations in Hawi. The pursuit ended when the suspect broad-sided a police vehicle, abandoned his vehicle and fled into a dense brush area. He has not been located yet. Officers are continuing to follow-up on leads as to his location. As is standard practice in any police-involved shooting, the Department’s Area II Criminal Investigation Section is conducting a criminal investigation into the shooting, while the Office of Professional Standards is conducting an administrative investigation. The suspect, 41-year-old Walter Gomes III of Kona, was last seen wearing a blue hoodie-type top with camouflage cargo shorts. He is described as being 5-feet-11-inches, 182 pounds with brown eyes and buzzed brown hair, a light mustache and unshaved face. Police advise the public refrain from contacting the suspect, and to report any sighting to the Police Departments non-emergency number at (808) 935-3311 or to contact Lieutenant Roylen Valera at (808) 326-4646 ext. 230, or via email at roylen.valera@hawaiicounty.gov.